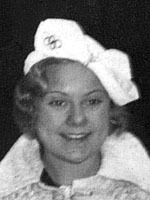 Sonja Henie, arguably the greatest winter sports athlete of all time knew success, fame, and fortune in an extraordinary life brutally cut short by leukaemia when she was at the height of her fame. The Norwegian held all the aces from the start: her father, a fur trader, was one of the richest men in Oslo (he was the first man in the city to own a car) who liked nothing better than to shower his daughter with lavish gifts. Dance was Sonja's passion, and father Wilhelm made certain she received all the best equipment and coaching, including the wise counsel of the legendary Swedish Olympic champion, Gillis Grafstrom. By the time she was ten Henie was Norwegian champion and she took part in her first Olympic Games a year later, in 1924, coming eighth. In 1927 she won the first of a staggering ten consecutive world titles and remained unbeaten in that competition until her retirement in 1936, just before her 24th birthday. She snapped up the first of three Olympic titles in 1928 aged just 15, thereby becoming the youngest person to win the figure skating title. Two more gold medals followed in 1932 and 1936, and in between there were six European crowns. According to most calculations she won 1473 trophies, cups and medals. But life was not always all plain sailing as she discovered in 1935 when at a competition in Germany she greeted the chancellor Adolf Hitler with the standard fascist straight-arm salute and a vigorous "Heil Hitler". Following the death of her father she moved to the United States where she had become an extremely popular figure, acquiring US citizenship in 1941. Two failed marriages to Americans followed before she linked up with a childhood sweetheart and shipowner from Norway in marriage number three. Everything she touched seemed to turn to gold. She even became a movie star, making 13 successful films. Her ice shows were always a hit, bringing her even more success and wealth. Television shows, advertising, movies...wherever she went, Henie became so famous she needed police protection and her fortune was estimated at 50 million dollars. Then, her world collapsed when she was diagnosed with leukaemia. Numerous trips back to Oslo for treatment were in vain and it was on one of these airplane ambulances taking her back to Norway that she died on October 12, 1969. She was 57.